Dramatic CCTV footage has been released of a man who had a lucky escape after running across​ ​railway tracks. The video is part of Network Rail’s ‘No ​Going ​Back’ campaign to stop people trespassing on railway lines. No Going Back is a hard-hitting film about the shocking consequences of distracted behaviour at and around train stations. The man can be seen cycling on the platform before jumping off his bike to quickly dash across the track. But seconds later he trips and falls in front of an oncoming train. He then struggles to get up and has to frantically crawl across the track to hide under the platform - missing the train by a matter of seconds. Moments later a second train then passes on the adjacent track, heading in the other direction. ​but ​has been recently released by Network Rail as they begin a new campaign to stop people trespassing on railway lines. 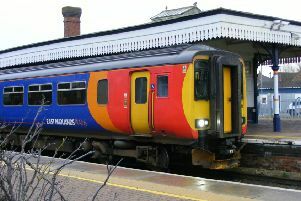 The man was prosecuted for malicious intention as he caused trains to be delayed. He was sentenced to four months imprisonment, suspended for 12 months, and ordered to carry out 120 hours of unpaid work. The dramatic video​ of ​​the incident​, filmed in 2011​, ​​has been released ​as part of ​the ‘No ​Going ​Back’​ campaign ​​to target​ ​school children aged 12 years old and older. They hope to highlight how seemingly harmless pranks or jokes with friends can lead to fatal consequences. Nicola Dooris, who is part of the team who released the film, said: ‘Films like these are a great way to engage school children and really bring home how dangerous the railway can be. ‘Many schools are located close to the railway track so we believe the behaviour shown in the film is something all children can identify with. In the last five years 142 people have lost their lives on the railways, many of them teenagers, and a further 254 have been injured. Visit www.networkrail.co.uk/safety for more information.